Aloha friends! Happy Friday. I'm ready to start the weekend and enjoy some beautiful weather, are you? I love it when the weather warms up because there are so many local events and activities going on. From outdoor concerts, to ethnic festivals, parades, charity events at local parks, church bbq's and fairs...the list seems to go on and on. This weekend I think we'll try to hit the ASPCA Dog Walk fundraiser and a Free local art museum day. My question for this week is: What do you have planned for fun this weekend? Thanks for stopping by today! If you are playing along, be sure to leave your linky. 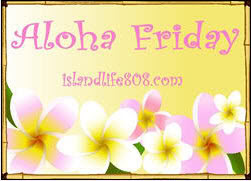 And visit Kailani at An Island Life for more Aloha Friday fun! I am going to a child dedication and hubby is getting installed as Pastor In Charge in the church! Busy weekend! I have nothing going on. Nothing much. It is going to be cold & rainy here I think all weekend so should be fun. - lol. Going to Wash D.C. this wk-end! Hubby has a Black Tie event for work on Sat. night. And they pay for our hotel - WooHoo! Then Sunday morning will meet up with bro & Sis-in-law and play golf at Army Navy course - fun! :) Happy Friday to all! I'm planning to sleep until noon on Saturday (which is fun for me and my kid:) and stay outside all afternoon with him in the sun! Oh fun!!! I hate to say it but that is usually the last thing on my agenda for the weekend. Sad I know! I guess I always think of the house cleaning, yard work, home improvement projects, soccer games, church and my weekend is over. Someday we might get our acts together and put fun on the top of our agenda. Oh, and seriouslY? you TOTALLY need to post about that cool trip with the expensive cab ride! We have nothing planned for the weekend. I really like this meme!!! This weekend? Not sure..lol. I know church for sure on Sunday, but for tomorrow, I have no idea!